who would have thunk it??? Wow, that's amazing! What fantastic artwork. Every day I wake up to a surprise...today this is it! THAT IS CRAZY! I JUST found the same artist on CL just the other day...and was amazed by his work! How cool for him! Those will probably last longer than any canvas... unless sharpie has some kind of acid in it! I love that guy! Rosie O'Donnell chatted him up awhile back when she was addicted to drawing on a Munny. 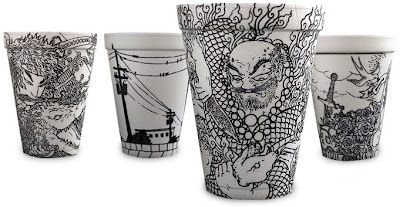 Munny = $10, styro cup = practically free. He's very good. Very fascinating! The cups are excellent, but I especially like his journal. Thanks for the inspiration! well i saw the cups also and they're fabulous. Art.Love from Greece! We blog too! Wow how fantastic. Thanks for previewing his work. I spent 2 hrs reading through his journal as well. It's so funny. Wow! Very creative and lovely! Thanks! i used to work at a snack bar at a hockey rink. a benefit of which was free soda, but we had to drink out of the styrofoam cups cause they were cheaper. in my spare time i would draw on them. one time i drew a dinner table covered in dishes and a tablecloth with a puppy peeking out from underneath. we also used one for our tip cup. so one day i drew an image of coins and dollar bills on one. i got a lot of compliments for it from customers. i like this guys drawings a lot better though. all i can say is.FREAKING SWEEETTT! his journal is funny as hell too.